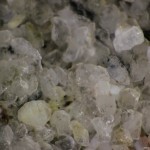 There is a lot more to see in a random scoop of sand than you might expect. 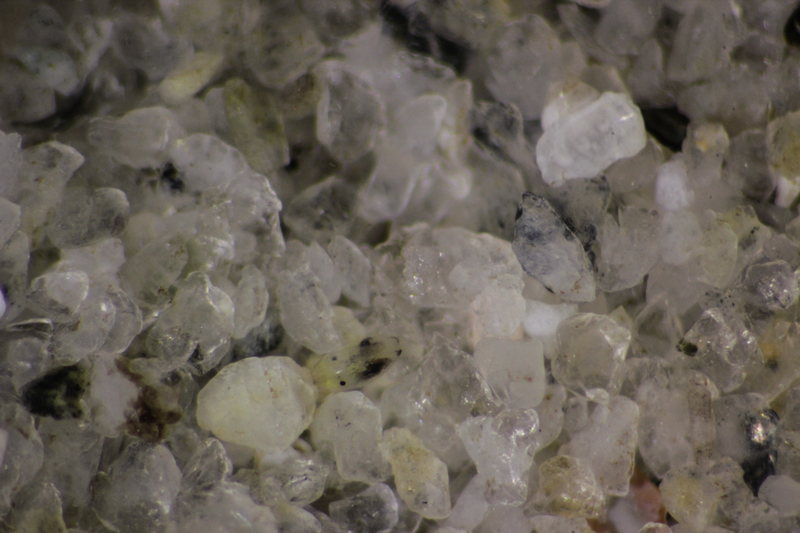 On a trip to the Monterey peninsula (California) I collected sand from a tide pool at the north end of Asilomar State Beach and then looked at it under a stereo microscope outfitted with the NIGHTSEA Stereo Microscope Fluorescence Adapter with Royal Blue excitation. 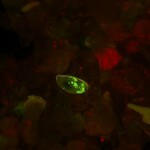 It is remarkable how much more there is to see in fluorescence! 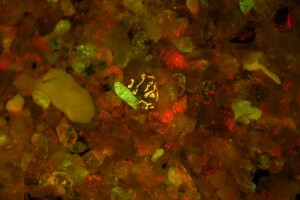 The first picture pair below shows an area of sand in white light and fluorescence. 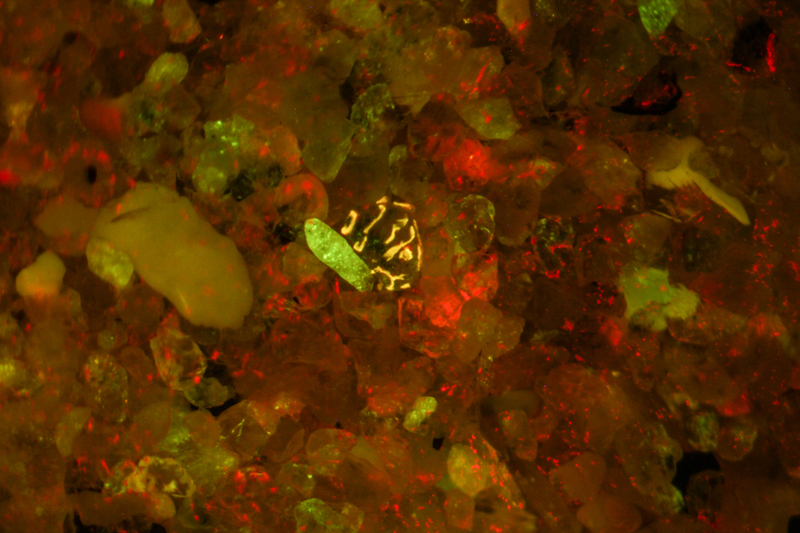 There is some color variation in white light, but the scene is so much richer in fluorescence. 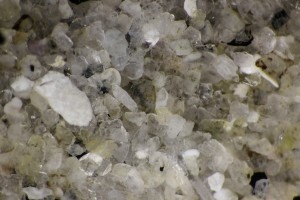 There seems to be some emission from mineral grains. 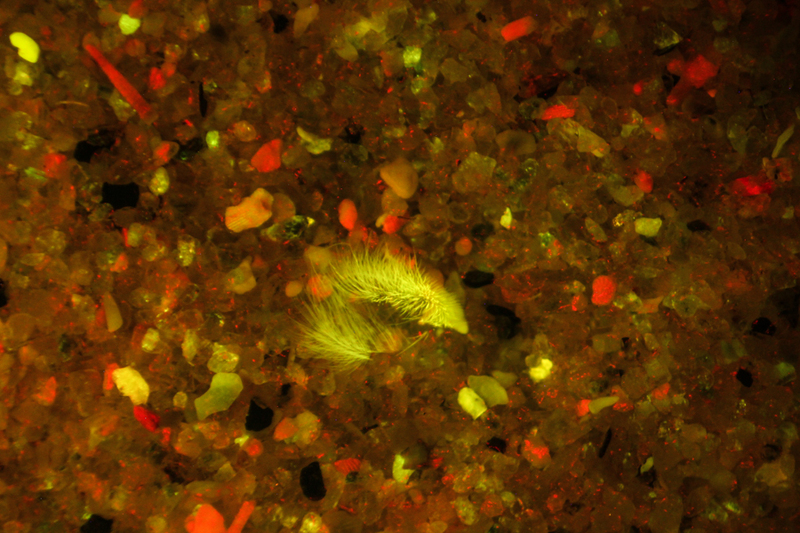 The striking red fluorescence comes from chlorophyll, whether small pieces of seaweed or algae growing on mineral surfaces. 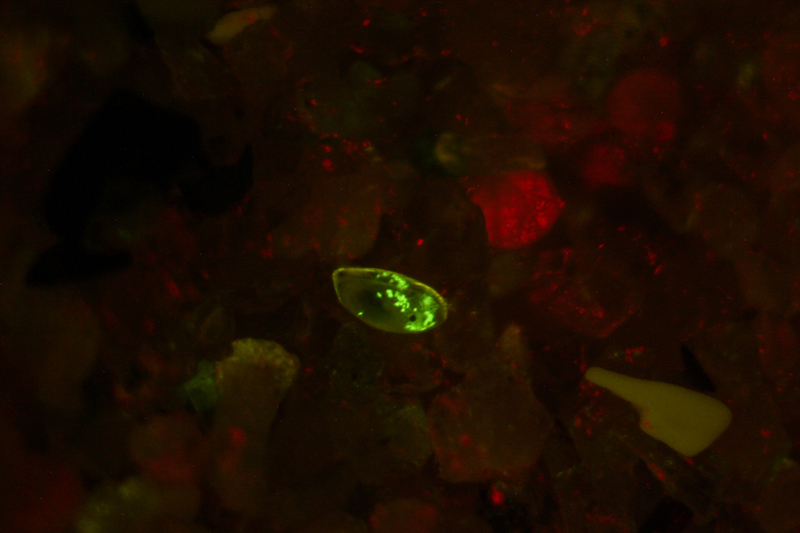 In this next pair we see something in fluorescence that is just about invisible in white light. Not sure what it is, but certainly the remains of a part of some organism. 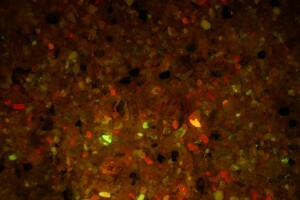 Now a larger sand grain that reveals a striking orange pattern in fluorescence. You can see some dull brown color in the white-light image. Orange fluorescence is often characteristic of phycoerythrin, a photosynthetic accessory pigment that occurs in red algae and cyanobacteria. We would have to look at higher resolution or do other testing to be sure of what this is. 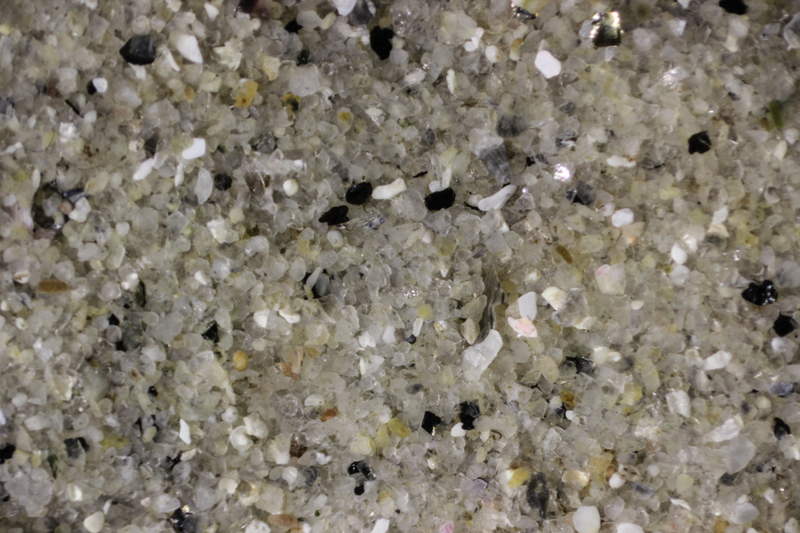 While I was looking at the sand under the microscope a brightly fluorescing animal kept swimming into the light and settling on the sand, apparently wanting to pose for an image. 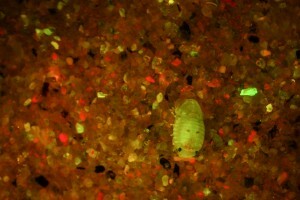 This turned out to be an ostracod, a small bivalve crustacean. That is, an animal in the shrimp/crab family that lives inside a hinged shell. 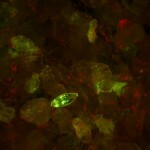 If you look carefully you can find this in the white light image, but it is striking in fluorescence. 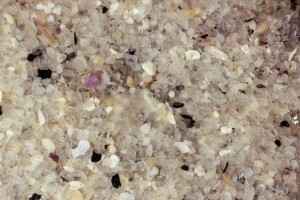 At one point I noticed the sand stirring but couldn’t see anything. 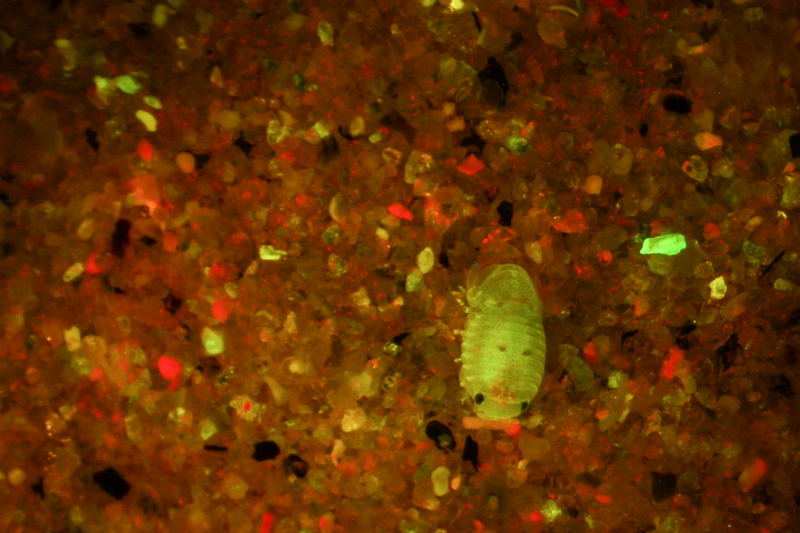 I moved the sand away to reveal an isopod, another type of crustacean. It was not strongly fluorescent and was also very light- and camera-shy. It would burrow back into the sand almost as quickly as I could dig it out. I was lucky to get this one shot. 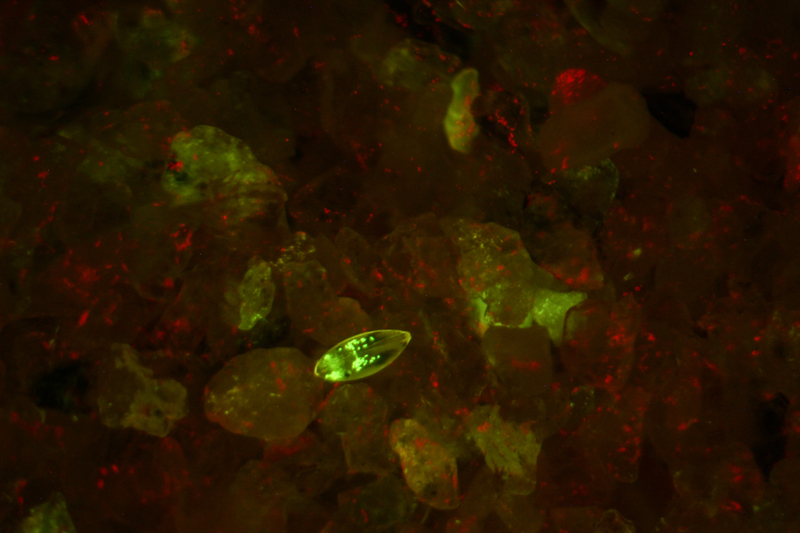 Once again we see that fluorescence reveals a richness and variety of life that can be very hard to see in white light. We have an article on the site that describes how fluorescence has the potential to be used for automated classification of seafloor (or sand!) scenes and this technique could easily be applied to these images. 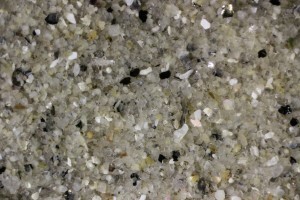 A day later I returned to the shore and collected sand from an area about 15 meters (50 feet) away from this first sample. 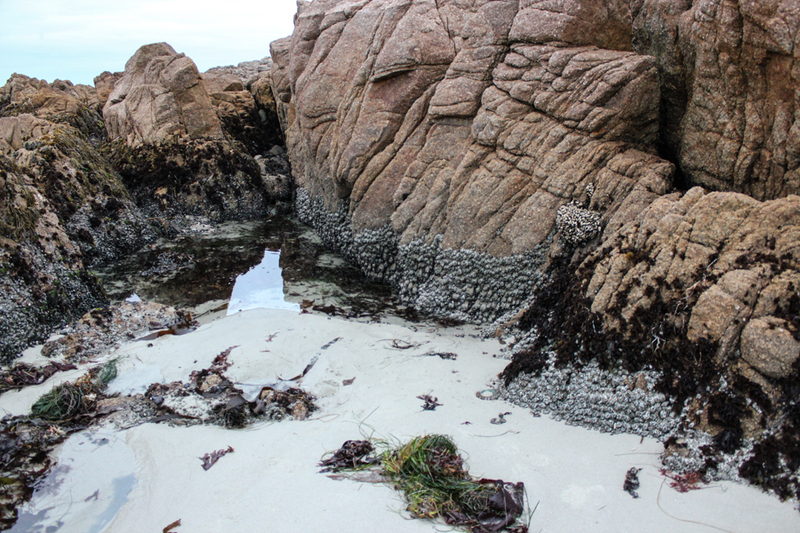 This was an area that was wet and wave-swept but not a standing tide pool and in this case there was almost nothing to see. 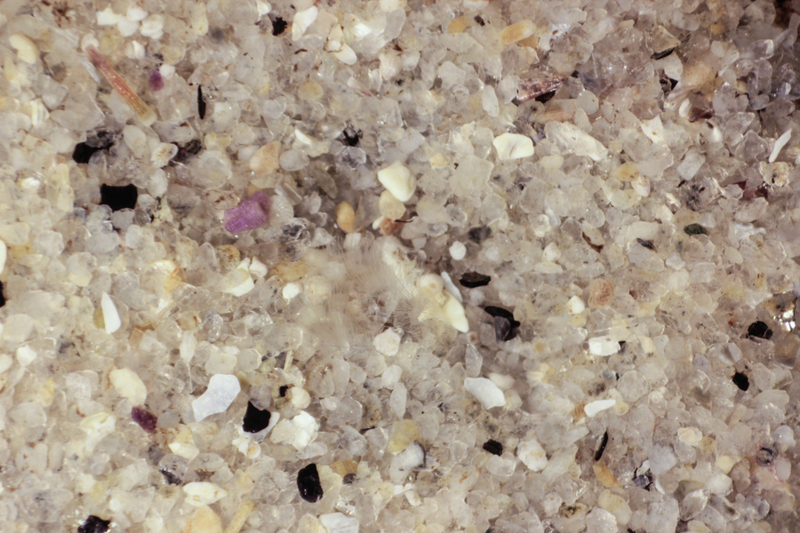 Some mineral fluorescence but nothing else – no chlorophyll coating the sand grains, and no life moving around. This is a great way to explore the ecological differences of neighboring environments that experience different conditions.